Starting at 8:00 a.m. Eastern Time on Tuesday, March 29, the Bureau of Engraving and Printing (BEP) will accept orders for the America’s Founding Fathers 2016 Currency Set with its two notes that share matching series numbers beginning with "2016"
a Series 2013 $2 note from the Federal Reserve Bank of Dallas with a portrait of Thomas Jefferson. The BEP packages the two bills within a tri-fold folder. The folder’s center panel holds the notes within a clear, polymer sleeve that is acid-free. The left and right side panels offer information about the currency and their engravings. During the pre-release period from March 29 to April 18, sales are limited to 25 sets per household. On the 18th, provided any remain, buyers can order as many as they want with bulk pricing available at $18.95 for quantities of 50 or more. The currency set may be ordered directly from the BEP’s online store at www.moneyfactorystore.gov or by calling 800-456-3408. The BEP notes that they will begin mailing them on April 19, 2016. These are beautiful BEP sets with “fancy” matching serial numbers that I have collected for years. Very nice addition to a collection for paper money collectors & usually sell out fast with 25 sets per household limit & only 5,000 sets. Free S&H & no tax always with the BEP too. Ordered two sets at 5 AM west coast time. All went well and done by 5:02. Hope to get low serial numbers. I agree totally. Those low serial numbers are always a nice surprise! Thanks, dude. Have a nice day. The last time I ordered sets early to get low serial numbers was the ‘triple deuce’ sets. My order was in at 7:59AM or so. The sets I received WERE NOT low serial numbers. The BEP told me there was no guarantee that early orders would have the lower serial numbers. I told them that I was accustomed to this practice in the past. They allowed me to send them back at THEIR expense for a full refund. Not sure if they reverted back to the old way of sending out sets. Hopefully in your cases they did and received enough complaints from the last issue. Happy collecting!!!!!! You would think the earliest orders would receive the lowest serial numbers, but we all know that is not the case. Just wishing. Do they shuffle the sets like a deck of cards and you get whatever comes up? I would like to know how they decide. My guess is the sets are divided out between X amount of people fulfilling the orders and you might get a set from the first stack or the last stack or anything in between. You got the procedure down exactly. The sets come in boxes packed randomly. This is because years ago a few paper money dealers placing large orders on day one were pressuring the mail order department to ship them the lowest serial number notes. When the supervisor of BEP mail order department found out, she put a quick stop to that practice & made sure the sets are somewhat at random giving all who order the same chance for low numbers. A good thing for sure. 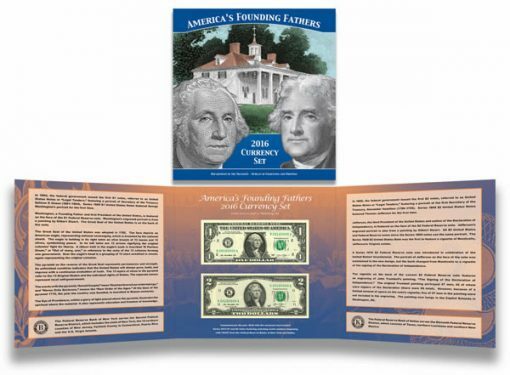 When I ordered the 2016 Founding Fathers sets, I also ordered a 2009 SF $2.00 bill from the $2.00 single note series offered on Aug 11, 2015 which hasn’t sold out yet. I have the complete 3 note set (ordered on the first day) with the SF note S/N L20155005A. I ordered it just out of curiosity to see what S/N I would get on the note this late in the game. Will let you know what it is when I receive my order. So Ben Franklin isn’t a Founding Father anymore? I know it would push up the price of the set, but still. And also, poor James Madison, no one could ever afford you… Could you imagine if the BEP actually released legal tender $5000 bills for this set? That will be interesting to see what # you get for sure on the 2015 single note. I got the 3-note set too on first day last year, but got last 4 digits in the 2700 range if I remember right. Rec’d my two sets of 2016 Founding Fathers sets on 4/8/16. Surprised because the BEP noted that sets wouldn’t be shipping until 4/19/16. As a follow up on the 2015 SF $2.00 note I ordered also, the s/n is L20153686A which is 1319 less (L20155005A) than the note I ordered on first day of sale, Aug 11, 2015. So, it is true you just don’t know what s/n you will get on the first or last day of sale. Haven’t heard of anyone receiving s/n 0001 on any sets. By the way, the s/n’s on the 2016 Founding Fathers sets are B and K 20160164A and 20160165A which are fairly low s/n’s.